It has been a while since we had a “house project.” Over the past 6 months we have been working on both the front and back yards. Since we moved in there was NO landscaping and we are the only new house on the block so I feel bad looking out the window to see nice yards and all our dirt and weeds. 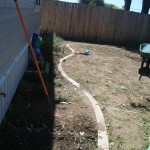 We first did the side yards with rock to keep the mud and weeds down. It took a weekend and two big piles of rick but it turned out nice. We finished this in January, which also happened to be the day our “big” earthquake so I guess I was just tamping the rock a little too hard!!! Next we did a mow strip around the back yard and a small raised bed for a kids garden. Drew really took this over and it turned out great. 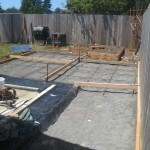 Just this week we had about 300sq of stamped concrete poured for a patio in the front and back. We were lucky to meet some great neighbors with concrete skills!!! Again, I love living here! 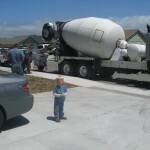 Here are some pictures, Bryson loved seeing the cement truck pull up. Next up we will be planting plants and doing the mow strip in the front. Hey Drew… Saw the new digs they look nice… also didnt know you had so many pics of the 2001 move in… now all i can think of is Hard Milk.